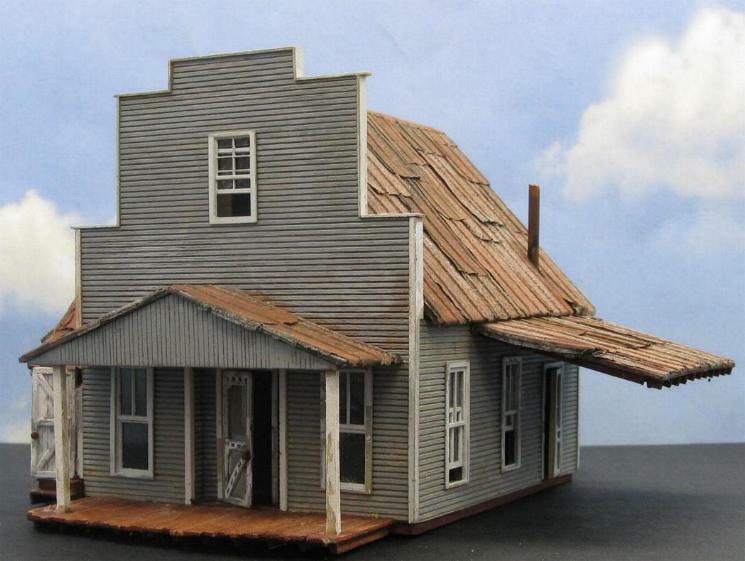 My custom built wooden HO BUILDINGS are made using the FINEST quality WOOD from authentic FINE SCALE MINIATURES and NORTHEASTERN SCALE LUMBER. 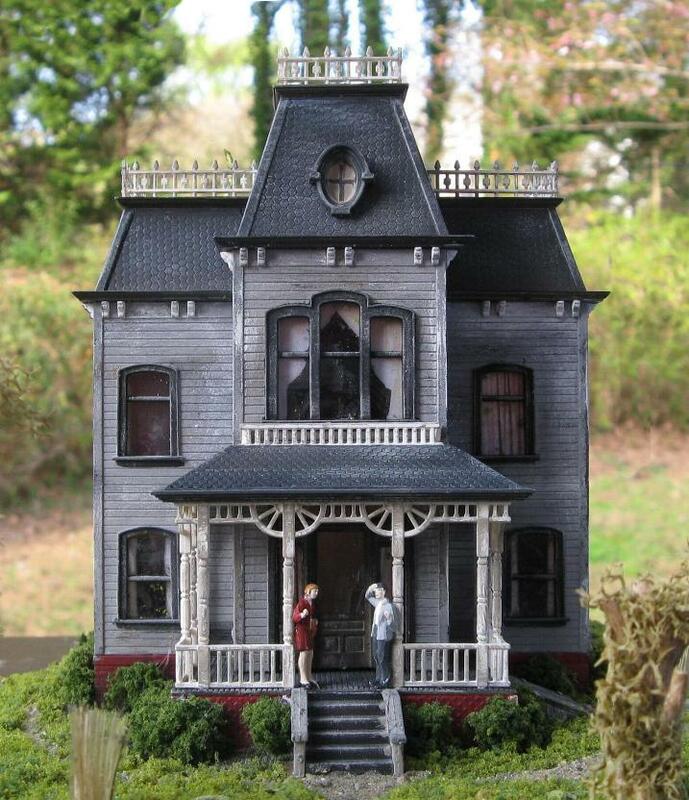 All of the METAL CASTINGS are made by FINE SCALE MINIATURES except where noted. 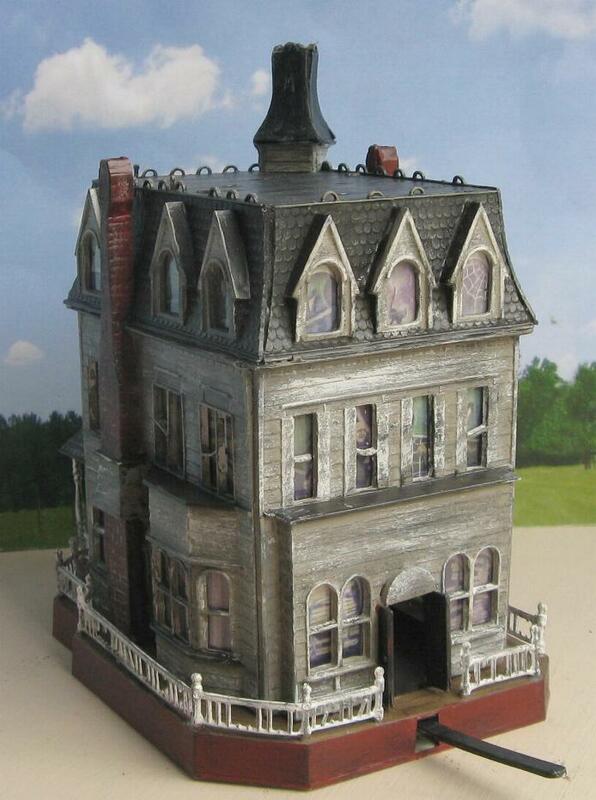 This is an outstanding BATES MANSION also known as the PSYCHO HOUSE with 3 people FIGURES (Norman, Marion & Mother) in HO 1:87 SCALE. 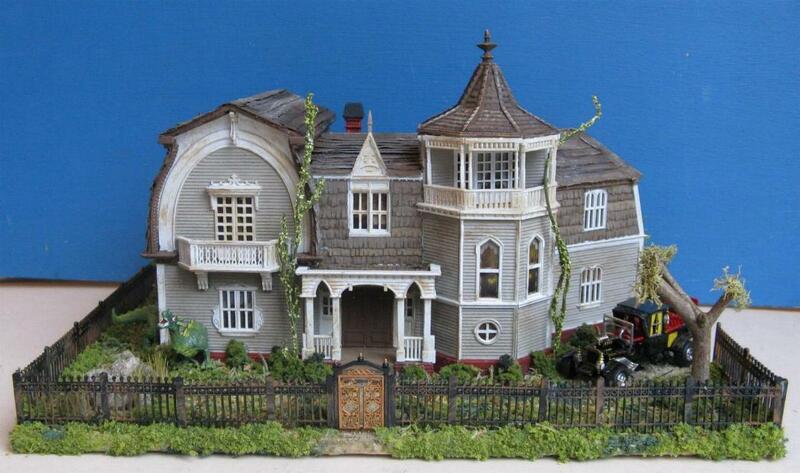 This is the VINTAGE 1998 version KIT by POLAR LIGHTS, and it was created and built by artist D.A. Clayton. 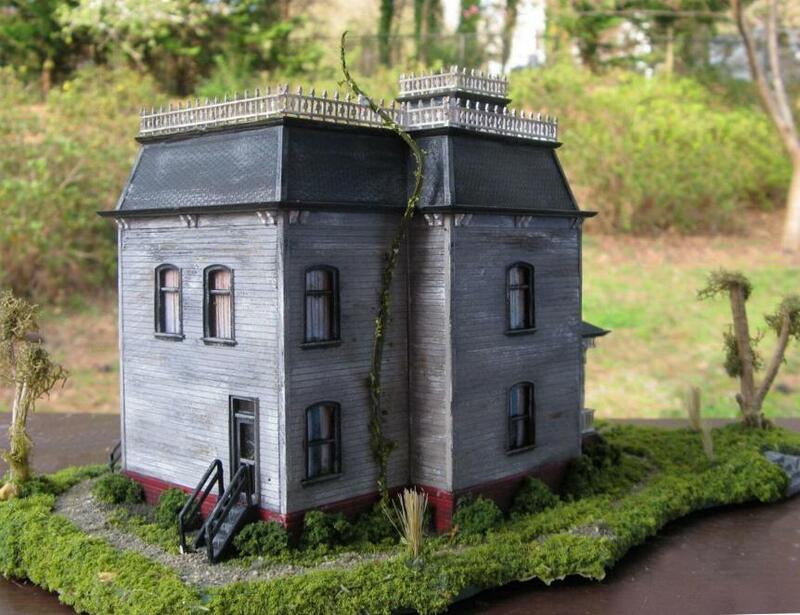 It has been BUILT, WEATHERED, DETAILED and ready to place on your Model Train layout or used as a stand-alone DIORAMA. 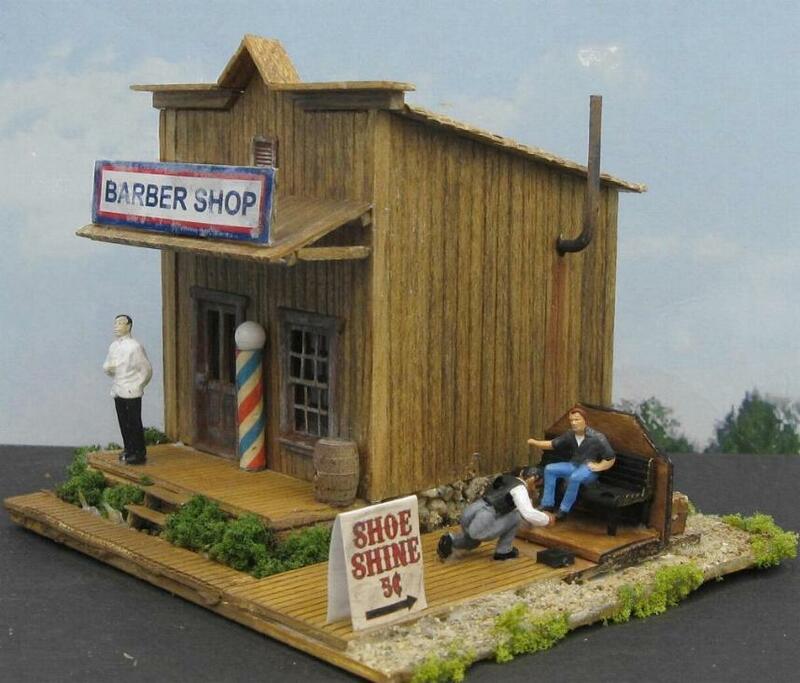 This is a custom detailed wooden BARBER SHOP & SHOE SHINE STAND. Details: Campbell simulated Cedar Shake Shingles, Wooden Framed Side Wall Sign, Stone Underpinning, Barber Pole, Stovepipe, Handmade Shoe Shine Stand with Sign, Barrels, Crates, Trash Can, Landscaping Bushes, Grass, Natural Sand, Acrylic Windowpanes, 3 Preiser Figures, etc. 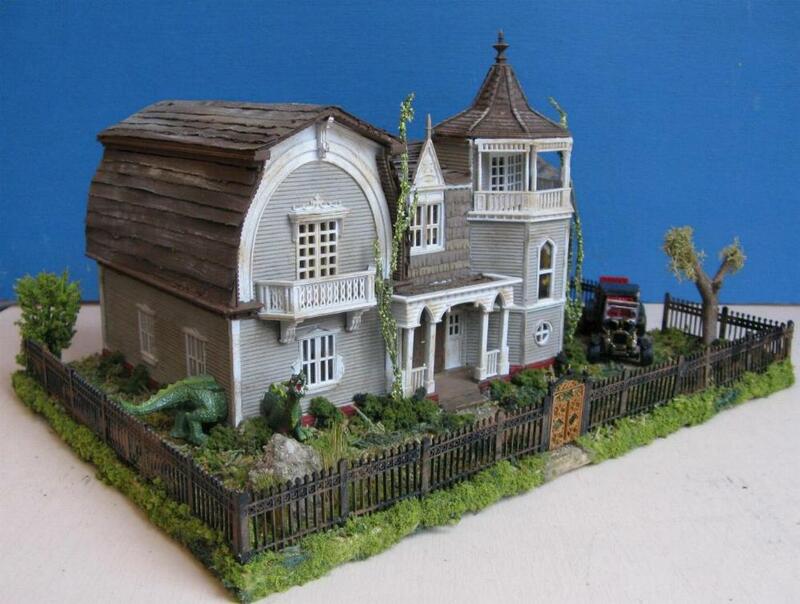 This is an extremely RARE ADDAMS FAMILY HOUSE in HO scale. It is an ORIGINAL 1965 AURORA built house, and is marked on the bottom 1965 AURORA. All FOUR (4) of the GHOST are present and are in working order. I added clear acrylic on the windows for more realism. It measures 7 ¼ inches by 5 ¼ inches (not including the Ghost Stick), and it is 7 ¾ inches tall to the top of the highest point. 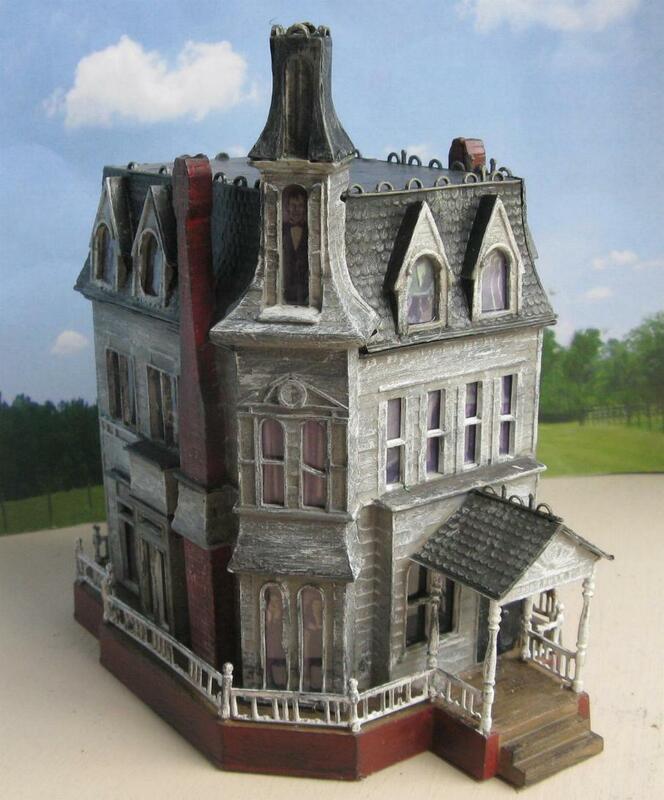 This outstanding ADDAMS FAMILY HOUSE has been built, painted, and ready to place in your MONSTER COLLECTION or on your MODEL TRAIN LAYOUT. SOLD! 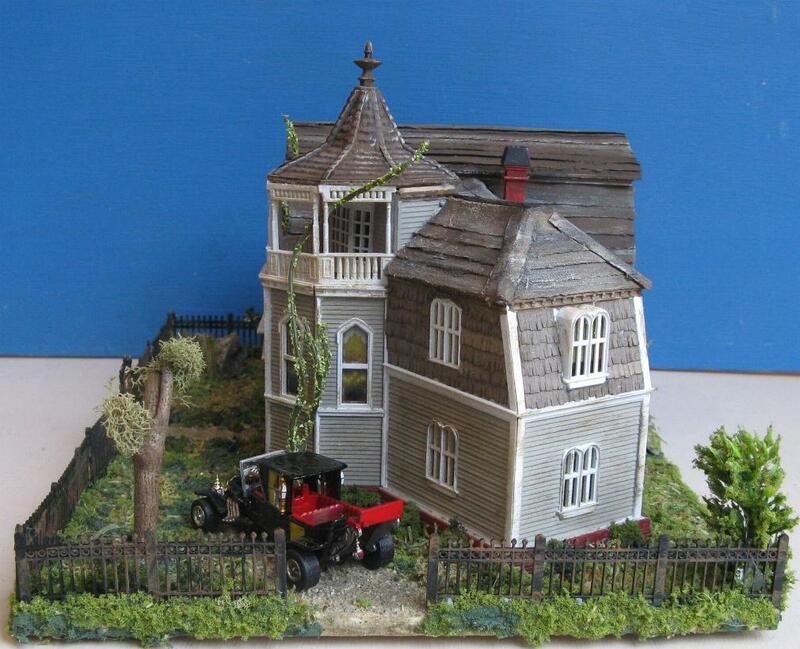 This one is SOLD, but I am in the process of building another one from a vintage 1965 Aurora Kit. These are RARE kits, and it will probably be the last one. 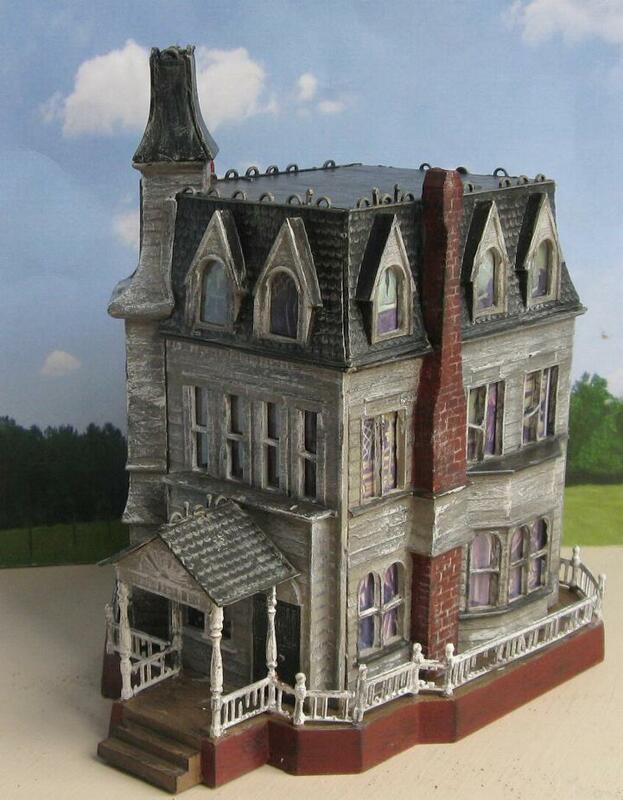 This is an outstanding ‘LED lighted’ MUNSTER’S HOUSE DIORAMA with all the ‘bells & whistles’ including the BARRIS KOACH car and the DRAGON in 1:87 HO Scale. 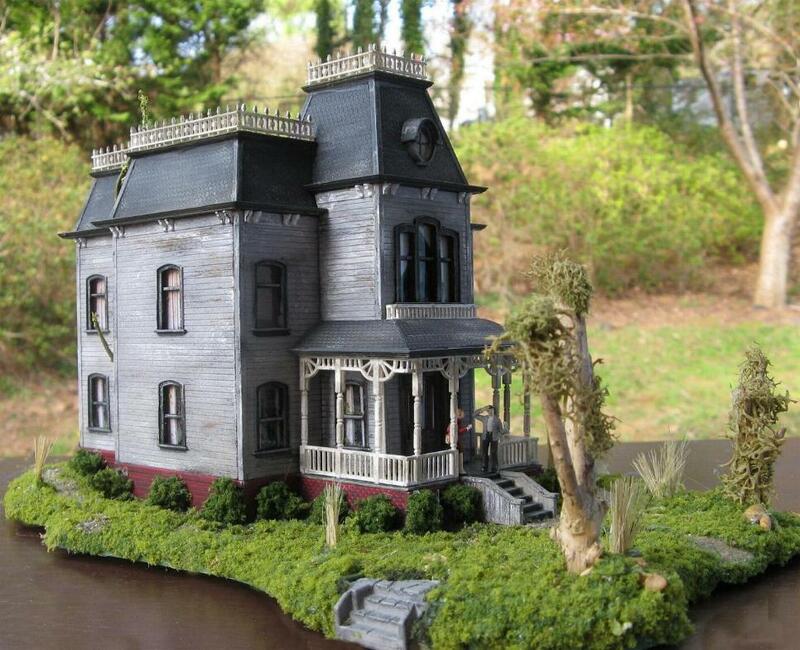 This house at 1313 Mockingbird Lane started life as a ‘brand new’ MOEBIUS kit, and is now a custom ‘One of a Kind’ build by artist D.A. Clayton. 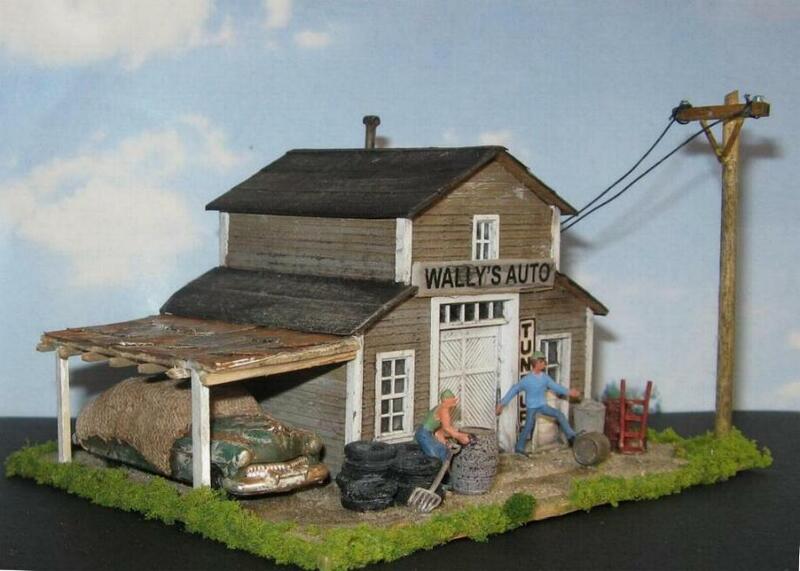 Many, many hours have gone into this customized diorama. 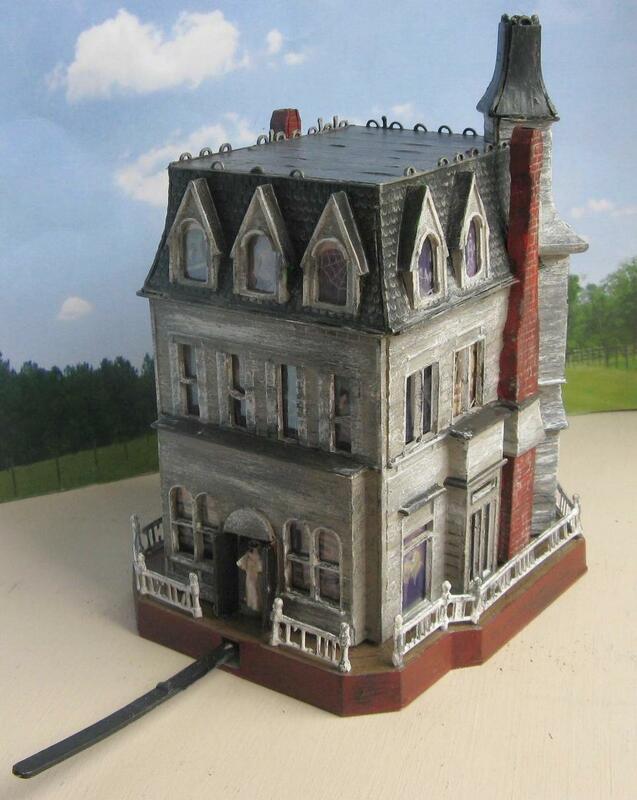 Listed below are some of the DETAILS of this fine DIORAMA. Details: Battery Operated ‘long life’ LED Front Porch Light with Battery Cover, Barris Koach 1:64 Car by Johnny Lightning, Dragon, Fence with Gate, Tar Paper Roof that was scratch built Strip by Strip, Bar Mills Cedar Shake Shingles, Trees, Bushes, Rock, Weeds, Vines, Natural Sand, Turf, Natural Driveway & Front Walkway, ¼” Birch Plywood Base, Custom Weathering, etc. For more PHOTOS, more INFORMATION, and or to BUY . . .CLICK HERE! 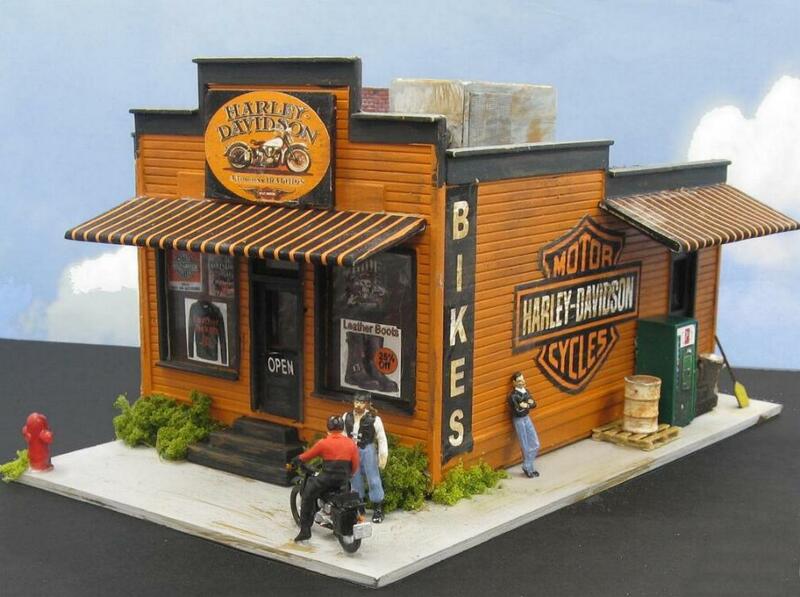 This is a super nice WOODEN craftsman built EVERSEST COUNTRY STORE by BANTA MODELWORKS in 1:87 HO scale. It measures approximately 5 inches by 5 inches and is 3 ½ inches tall. 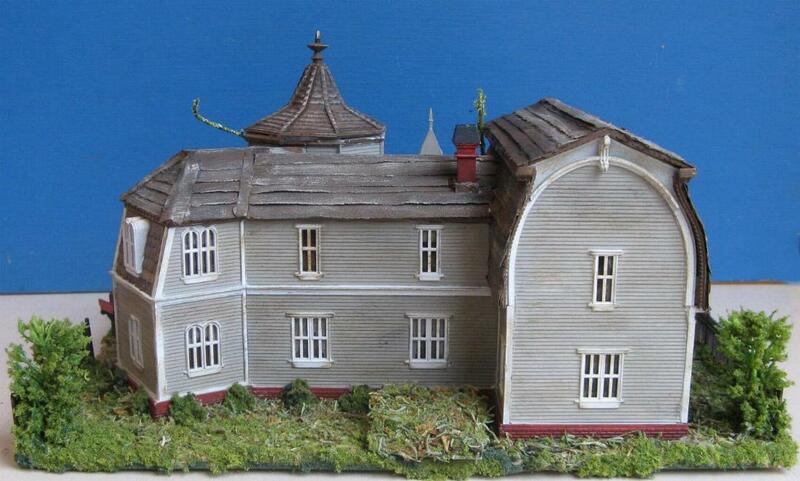 This outstanding building has been BUILT, WEATHERED, DETAILED by D.A. Clayton and is ready to place on your layout. For more PHOTOS, more INFORMATION, and or to BUY . . . .CLICK HERE! 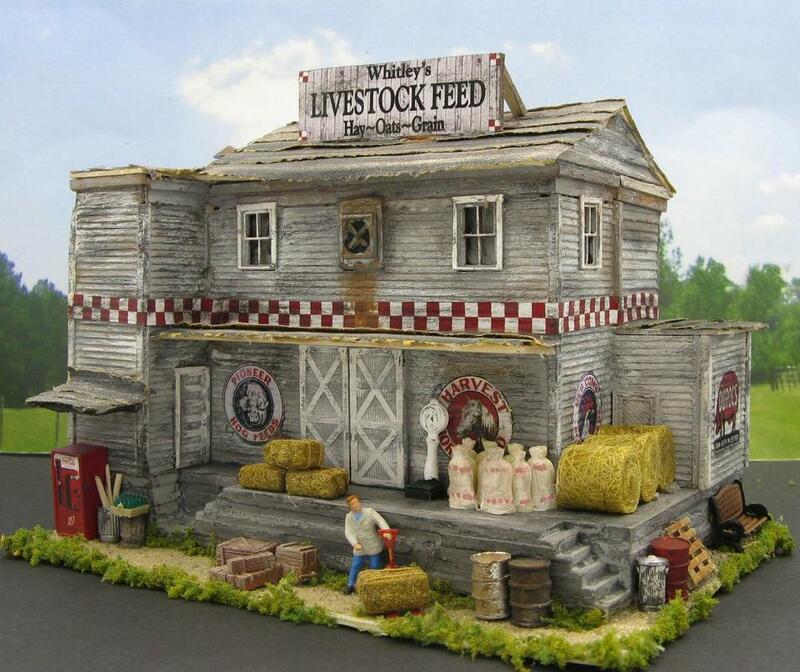 This is a really nice wooden ‘scratch built’ craftsman GARAGE or BARN with BAR MILLS Cedar Shake SHINGLES in 1:87 HO scale. All of the CAST METAL pieces are by FINE SCALE MINIATURES. The wooden CLAPBOARD has NAIL HOLE. 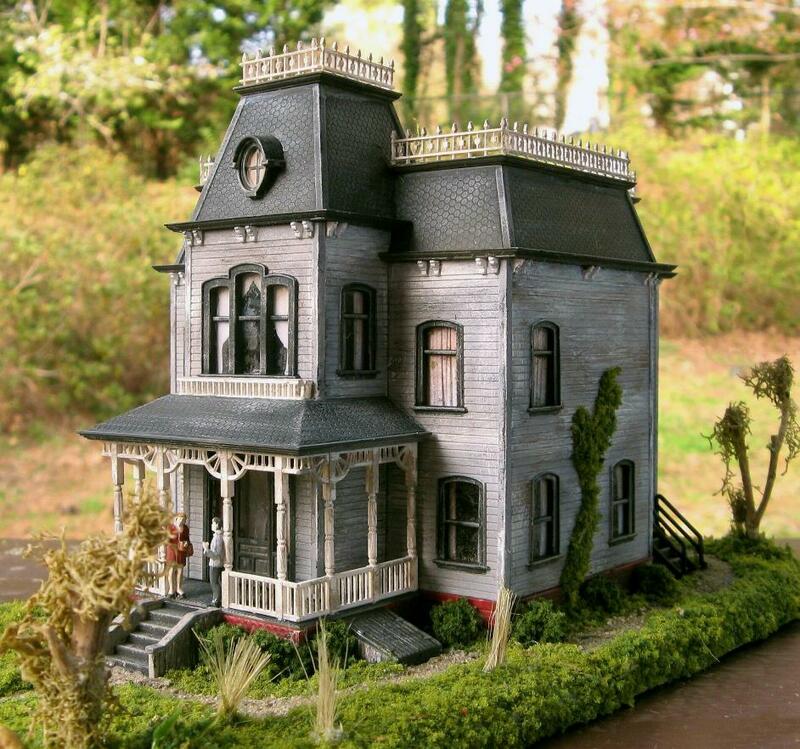 It measures 2 ¾ inches by 2 ½ inches and is 3 inches tall. etails: Athearn 40’Box Car, 6 Preiser Figures, Rusty Bicycle, Creek Stream bed, Fire with Stones & Wood, Wood Pile, Metal Tree Stumps, Crates, Barrels, Natural Sand with Grass Turf & Tree, Train Track, ¼” Birch Plywood Base, etc. Figures: 1 Sleeping in the Box Car, 1 Sitting in the Box Car, 1 Fishing, 2 Sitting by the fire, and 1 Walking. Size: 8 inches x 5 inches and is 2 ½ inches tall. Signature: Signed D.A. Clayton & Dated. Details: Nice large H/VAC System on the Tar & Gravel Roof, 3 PREISER Figures & a PREISER Motorcycle, Awnings, Fire Hydrant, Soda Machine, Barrel, Skid, Trash Can, Broom, Ghost Signs & Store Advertising Signs, Acrylic Windowpanes with Shades. Grass Turf, etc. Size: 5 ½ inches x 3 ¼ inches and is 3 inches tall . To see more PHOTOS or more INFORMATION or to BID or to BUY . . .CLICK HERE! 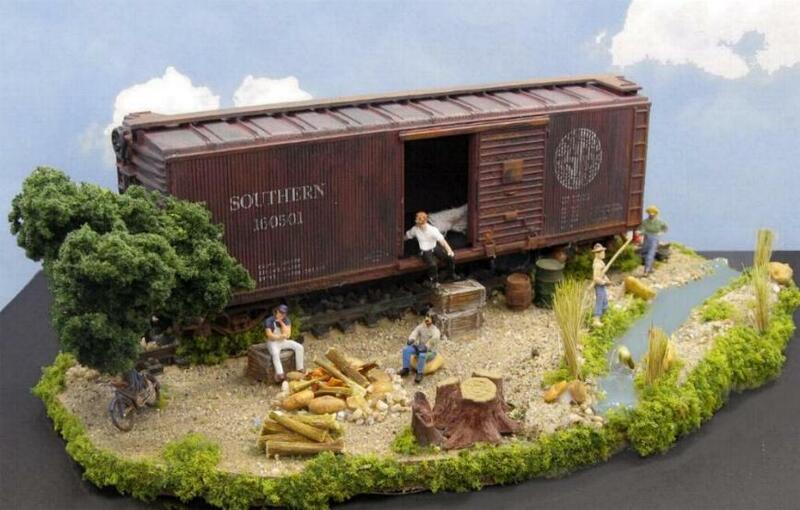 Details: All wood construction, FSM Cast Metal detail pieces, Rusty Tin Roof, 2 Preiser Figures, Vintage Car, Wooden Electrical Pole, Kerosene Tank, Tires, Barrels, Crates, Dolly, Trash Can, Acrylic Windowpanes, Natural Sand Landscaping, Grass Turf, etc. Size: 4 ¾ inches x 4 inches and is 3 inches tall to the top of the pole. Details: Hand Carved Hydrocal Base with Steps, Tar Paper Roof with Chimney, Wooden Roof Sign, Toledo type Scale, Feed Sacks, Rolled Hay, Bailed Hay, Coca-Cola Machine with an Empty Crate of Bottles, 2 Trash Cans, Crates, Barrels, Skid, Bench, Acrylic Windowpanes, Natural Sand & Turf Landscaping, etc. Size: 6 inches x 4 ¼ inches and is approximately 4 ½ inches tall to the top of the sign. Build: Custom Built, Hand-Painted (Never Air Brushed) & Weathered.